"A year ago, investors were losing faith in Palm Inc. The once high-flying company itself admitted to frailty and mistakes. But Palm never gave up, and launches Monday a new operating system -- a crucial weapon in its battle to remain dominant in the competitive handheld market. Palm OS 5, analysts say, is a much-needed major upgrade from the pioneer of personal digital assistants' earlier operating systems." Read the report at Yahoo!. Update: Palm pins hopes on beefed-up OS. Openwave Systems Inc., the worldwide leader of open IP-based communication infrastructure software and applications, announced that it has contributed its Open Usability Interface server-side programming library and source code to the open source developer community under a Mozilla License. Openwave is contributing Open Usability Interface as a code base for developers for developing mobile applications that can be accessed through multiple networks and mobile devices. Open Usability Interface is a server-side programming library that that abstracts the presentation of content from the underlying platform implementation details. In practice, developers code to the capabilities that each platform offers. The library presents the best possible user experience by adapting the application user-interface for the particular device and gateway requesting the service. Kyocera are hard at work to release their first PDA product. The Pocket Cosmo runs Personal Java 1.2 on top of the Elate operating system from Tao Group Ltd. This will allow it to run programs written in Java faster and using less memory than other PDAs, which usually run on a Windows, Palm, or Linux operating system, according to a statement. "The Palm handheld computing platform is moving ahead with advanced new technology, but users and developers shouldn't expect to see a big change overnight, according to company unit PalmSource." Read the rest of the report at News.com. "Palm subsidiary PalmSource introduced a new program to help software developers create applications for its upcoming operating system. PalmSource is offering a kit that includes a Palm OS 5 simulator so developers can test their applications on the operating system. PalmSource is also introducing the Palm Powered Compatible Solution logo, which can be applied to applications that pass compliancy tests with Palm OS 4 and 5. The test will be administered by a third party and requires a fee. The fee and availability of the test will be announced early this summer with the launch of PalmOS 5. The logo is meant to help consumers identify software that meets compatibility standards." Story at ZDNews. "Although many people frequently belittle Palm OS 4 as being nothing new, it has introduced true disk-like expansion to the Palm platform en masse. Although not the first instance of expansion options for Palm OS, OS 4-based devices are now appearing in droves, ushering in a new wave of applications and possibilities. Of course, as with any major step forward, with all of these new options come new problems, incompatibilities, and confusion." Part I, Part II and Part III of the article at InfoSync. "When PalmSource, Palm's operating system unit, previewed the Palm OS version 5 at the PalmSource conference in San Jose earlier this year, participants got a chance to see a test version of Palm's next-generation OS in action." Read the rest of the story and the comparison chart of PalmOS at ZDNews. "Symbian today said it will open most of the source code for its mobile operating system to third party developers, in its latest effort to encourage the creation of more software for the platform. The company also announced that German electronics giant Siemens has agreed to buy 5 percent of the company for more than 20-million euros ($17.8 million). The software company, which is co-owned by Psion as well as Sony Ericsson, Nokia, Motorola and others, already provides most of its code to its licensees, and will offer the same access to software developers through a new plan called the "Symbian Platinum Program". A number of third parties have already committed to joining the program, including Intel, AppForge, Texas Instr. and UK chip-designer ARM Holdings." Read the rest of the story at ZDNews. Palm, Handspring Doomed by Wireless? "Palm may be on the way back to profitability, but it has serious challenges ahead as wireless convergence looms, according to a new report. In the report, Strategic Challenges In The Future Market For Handheld Devices, Denmark-based analyst firm Strand Consult predicts that Palm and Handspring will be crushed between the financial clout of Microsoft and the entrenched distribution networks of mobile phone manufacturers, once the focus in the PDA market shifts to wireless-enabled devices." Read the rest of the story at ZDNews. According to Tiqit, although this feature was previously considered impossible to engineer, the eightythree is not a concept product. Instead, Tiqit says it has built -a mass produced- a fully functioning x86 handheld device out of cutting-edge but available parts, designed specifically for enterprise use and immediate production. In terms of components, eightythree's CPU is the National Semiconductor Geode, 266-300 MHz, RAM is 128 MB or 256 MB, and there is a 10 GB hard drive. The screen is a 4-in 640X480 TFT (18-bit color) with touchscreen and backlight. The external monitor displays up to 1280 x 1024 at 75 Hz, 1024 x 768 at 85 Hz. eightythree is powered by an internal lithium ion rechargeable battery. "This product will greatly accelerate adoption and use of handhelds in the enterprise," said Ian Blasch, CEO, Tiqit Computers. "It uses standard operating systems -- Windows XP, Linux or UNIX -- and is compatible with all associated applications, including legacy software. Almost anything you can do on a laptop or PC, you can do on eightythree -- only it is smaller and more mobile." Along with our XML or PHP news feeds, OSNews is now offering WAP support for the readers that own a WAP-enabled mobile phone. Just point your WAP device on http://wap.osnews.com/ or on http://wap.osnews.com/index.wml and you should be able to access our 15 latest headlines. Please report any problems you may find on our comments section. Additionally, people with 4th generation mobile phones (mostly sold in Japan) capable of HTML should be able to render OSNews in full HTML, but in a more simple manner (no ads or nested tables). Just follow the same instructions as we have for the AvantGo, Lynx, Links and W3M browsers. Check the screenshot showing some WAP emulators and the three major text browsers rendering the alternative (and simpler) OSNews pages. UPDATE: I did some changes on the WAP source, please let us know if it now works ok with your devices. Thanks! "Sony Ericsson Mobile Communications today unveiled the P800, the company's first multimedia communicator sporting tri-band GSM/GPRS and integrated Bluetooth, a 208 x 320 pixel resolution color touch-screen, and a built-in digital camera. Running Symbian OS 7.0, the P800 is the most advanced GSM-based communicator in the world to date, and bears the potential to give Nokia's 7650 some serious competition - although the smartphones don't really compete in the same class." Read the rest of the report at InfoSync. 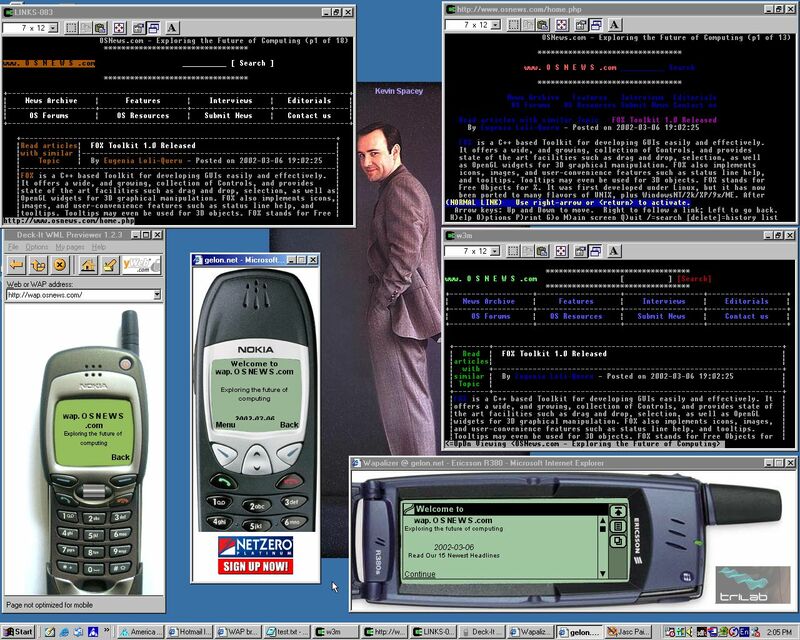 Editorial: Is Palm the Next Netscape? Descriptive quote from the editorial at OSOpinion: "Even though Palm's operating system still owns more than half of the PDA (personal digital assistant) market, Microsoft's marketing engines are roaring. With Microsoft aligning with Intel, and making a full-court press to capture more of the mobile operating system market, it is not hard to see a new Microsoft-Netscape battle brewing. This time, though, the battle is more than just browsers. It is about full operating systems, and Palm now is the would-be David facing the Goliath of the software industry." "Version 7.0 of the Symbian OS is here, with improved support for 3G networks, EMS, MMS, IPv6, MIDP Java as well as a slew of improvements related to security and certificates. The successor to version 6.1 of the Symbian OS, v7.0, has been launched at the GSM World Congress in Cannes, France, bringing with it features that the mobile industry needs and wants. The new version builds on v6.1 and includes new communications, messaging, networking and application development technologies to more easily implement 2.5G and 3G technologies in new phones." Read more at the one place for PDA and cell phone news, InfoSync.